A pool repair is necessary as soon as you notice a problem, because not repairing your pool can lead to more serious problems in the future. We provide swimming pool repair services, but we also provide pool cleaning and maintenance services too here in Phoenix as well as nearby cities such as Scottsdale, Peoria and Mesa. If you hire us for regular pool cleaning services, we can often spot any problems that might need repairing on your swimming pool sooner than you might notice them. 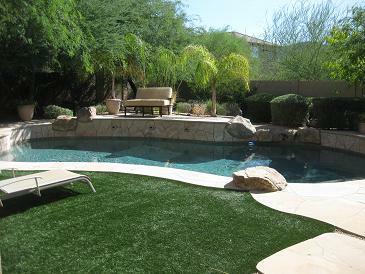 Dan's Pool Catering, the best choice for a swimming pool repair company in Phoenix. or it's just old and worn out. If you have a leak or a crack in your pool equipment, we can find out where the leak is coming from and make the pool equipment repair so that your pool is as good as new again. If you have a leak or crack in the plaster or concrete walls of your pool, we can fix those as well. If you have a problem with the pump or filter of your swimming pool, (for example, if you need the filter cleaned or you need the seal of the pump replaced), we can replace or repair the parts and pieces of your pool equipment as well. No matter what kind of pool repair you need, our professional service technicians will be happy to help you. If you notice anything out of order with your pool or the way it’s operating, please feel free to contact us with any questions. Maybe you have a mysterious noise or a leak that you can’t pinpoint. We can help you with these and other swimming pool issues, whether you live in Phoenix, Arizona as well as Glendale, Scottsdale, Peoria, Tempe, Gilbert, Mesa, Paradise Valley, Fountain Hills, Cave Creek, Carefree and the surrounding areas. Swimming pool repair may sometimes seem like an easy process, but it can be more complicated if you don’t know where the leak is coming from or what part of your pool pump is malfunctioning. We have the knowledge and all of the tools to fix the problems you have with your pool. This way, you won’t have to worry about anything except finding your favorite pool toy. We’re a professional company, and we work hard to make sure our customers are satisfied. Using covers for your pool can protect it from the elements. Not only will your pool be cleaner, because you’re keeping bugs and debris out, but it can also keep your pool from needing any pool repair for a longer amount of time. If you have a bug problem, you can use tiki torches, citronella candles, or bug sprays for the perimeter of your yard to keep some of the bugs away. You can also buy test strips to keep the chemical levels in your pool balanced. This way, you’ll know when your pool needs servicing. If you need a reliable company to come clean your pool on a regular basis, or you have a problem that you want to get inspected, give us a call. 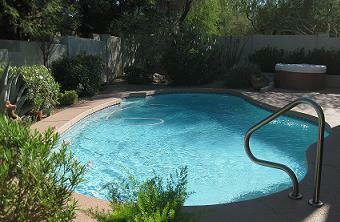 We do all kinds of repairs throughout the Phoenix area, and we would be happy to take a look at your swimming pool. A pool is an important part of your home. It’s where you play, exercise, relax, and where you entertain guests. Pools are also an investment, and if your pool isn’t working correctly, it’s like money down the drain. We’ll help you with any of your pool needs. 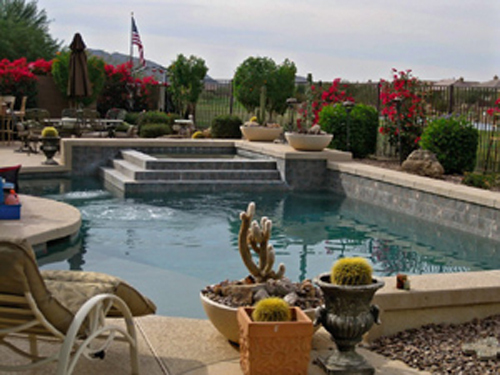 We provide pool repair in Phoenix, Arizona as well as Glendale, Scottsdale, Peoria, Tempe, Gilbert, Mesa, Paradise Valley, Fountain Hills, Cave Creek, Carefree and the surrounding areas. When you hire us for regular pool cleaning services, we can often spot any problems that might need repairing on your swimming pool sooner than you might notice them.